The Fourth of July seasonal pages will provide you with resources to celebrate Independence Day for the United States of America. Ideas within this section include: art projects, musical activities, lesson plans, and more. Your creativity can help other teachers. Submit your Independence Day activity today. Don't forget to include additional resources-documents, web sites, or a photo. Fourth of July - In the United States, 'Independence Day' is more commonly referred to as the Fourth of July. It commemorates the adoption of the Declaration of Independence on July 4th, 1776, declaring independence from the Kingdom of Great Britain. This is an easy decoration to create. All you need is a piece of poster board, tempera paint, and hands! Check out our large selection of "make your own" worksheets fo rthe 4th of July! Quickly make crosswords, word search puzzles, word scrambles, match-ups and other great puzzles. This activity will make a brightly colored firecracker that can be used as a desk decoration or centerpiece. It's easy and fun to do for all ages! Find links, crafts, songs, and more. Fourth of July puzzles, games and more. The Teacher Planet has a great collection of lessons, units, and worksheets. 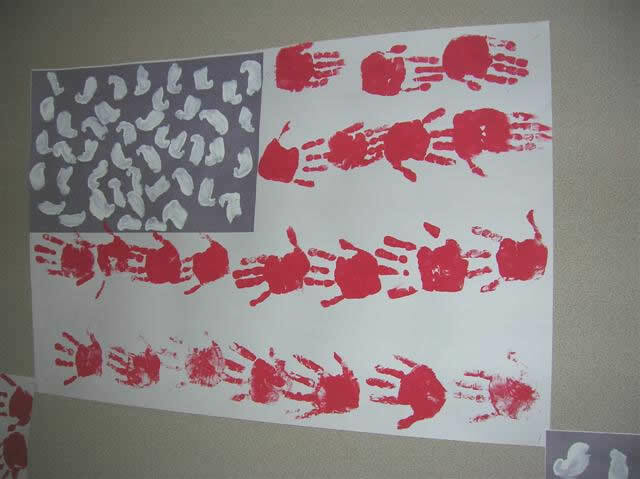 These American Independence Day crafts projects from Enchanted Learning are for preschool, kindergarten and elementary school children. The Fourth of July crafts use materials found around the house, like paper, cardboard, boxes, string, crayons, paint, glue, etc. Students will be able to name the number of stars, the number of red stripes, the number of white stripes, and name what each represents. Betsy Ross sewed the first American flag. Learn more about the flag and let others know what the flag means to you. Fourth of July Crafts, Games and More. A great resource for printables, crafts, recipes, and links. A fun art activity for younger students. An Education world resource that includes activities, Internet resources, biography links, and much more. Using "America the Beautiful" and "The Star Spangled Banner," students will learn about songs that express American Ideals. Using "The Star-Spangled Banner," his is an easy, enjoyable way to teach vocabulary, reading comprehension, English as a second language, and even some history. Reading comprehension and vocabulary of any language can be improved by adapting this lesson plan. Fun and easy craft ideas from the folks at Making Friends. To illustrate a patriot song through a student created art slide show for a patriotic holiday event. Students will understand what they say every morning during the pledge of allegiance. Take a live look at Lady Liberty! To celebrate the 4th of July and generate public appreciation for our nation's history, Teaching with Historic Places is featuring lesson plans related to America's battle for independence, the creation of our nation, and other lessons with related Independence Day themes. EMAIL us your favorite Favorite Fourth of July Activity!